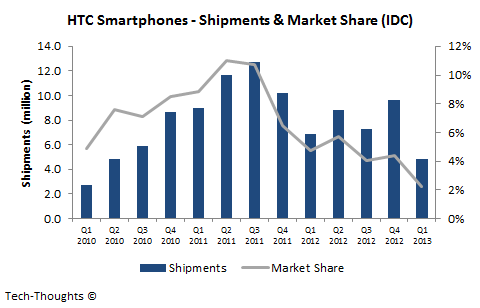 HTC has seen its smartphone shipments and market share drop steadily over the past couple of years. The company had pinned its hopes on the HTC One, but production problems derailed the launch. This has led to a mass employee exodus, which has put the future of the company in peril. Most people think that this was a direct result of Samsung's deep pockets and vertical integration. However, HTC's own strategic missteps may have caused its decline and this could make them a potentially attractive acquisition target for regional smartphone OEMs. In the face of increasing competition from Samsung's Galaxy series and Apple's iPhone, HTC's biggest failure has been its inability to establish a coherent branding strategy for its Android-based smartphones - This is something that even Nokia has managed to pull off with the Windows Phone-based Lumia series. With multiple devices and weak sub-brands, consumers shifted away to stronger sub-brands from competing vendors. In 2011, HTC had a hit on its hands with the Desire series, but it promptly added many other high-end products and sub-brands to its range (some of which had quality issues). At that point, it was difficult for a "hero" or "flagship" device to emerge which could generate consumer interest. HTC has been attempting to correct this with the "One" branding, but it has already lost a lot of ground. HTC's marketing strategy has consistently focused on pushing its high-end devices. This worked very well in 2010-2011, when the US smartphone market was exploding. As HTC expanded its product line, they considered this to be a "winning formula" and put even more effort into marketing new high-end devices, which didn't have a recognizable sub-brand. At this time, its mid-range and low end products were fairly nondescript to mainstream consumers. Meanwhile, Samsung and regional vendors were busy strengthening their low-end and mid-range portfolios. As mature, subsidized markets began to slow, emerging markets took over as the global smartphone growth engine and HTC lost another opportunity. The worst blow to HTC was the launch of the Windows Phone-based HTC 8X as the company's flagship product. The device sold poorly and did nothing to help HTC differentiate from competition. As I had previously shown, a different platform is never a long-term, sustainable, competitive advantage (just a hygiene factor) and commoditization is inevitable. But in this case, the weak Windows Phone platform put them at an immediate competitive disadvantage. During this misadventure, HTC lost crucial time that could have been used to focus on emerging markets and generating market awareness for its mid-range portfolio. The company then followed up the HTC One launch with the Facebook Home powered HTC First. As I expected, Facebook never considered the HTC First to be anything more than a marketing vehicle for Home (although consumer response to Home was far worse than I expected) and the phone was a complete disaster. Despite the production issues and the buzz generated by the Galaxy S4, HTC One sales have totaled an impressive 5 million. This suggests that HTC still carries some clout in the high-end smartphone market, if not in any other segment. However, HTC's position in emerging markets suggests that it will struggle to regain scale. This provides an opening for regional OEMs such as Lenovo to acquire HTC. Lenovo already has a firm foothold in emerging markets and acquiring HTC would give Lenovo access to higher value segments of the market. Given the fact that other potential targets in the smartphone industry (such as Blackberry & Nokia) face far greater challenges, HTC could be a particularly attractive target.